Learning how to play jazz guitar chords can seem like a tough hill to climb. There always seems to be new chords that you need to learn, and each of these chords has myriad variations and fingerings to work out on the guitar. But, while there are a lot of options when learning jazz guitar chords, you don’t have to learn every shape before you can begin making music. 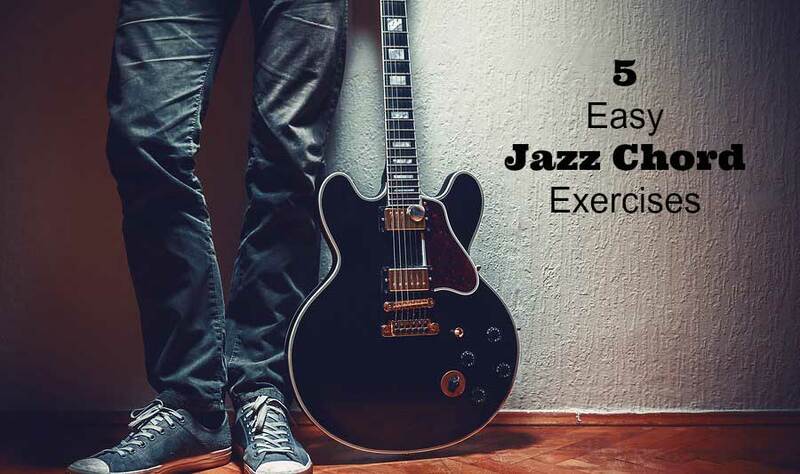 By starting with a few easy jazz chord shapes, one popular jazz rhythm, and five classic jazz progressions, you’ll build your confidence with jazz chords in no time. This lesson will help you do just that, build your confidence, have fun learning jazz chords, and expand your jazz chord knowledge all at the same time. To begin your study of these easy jazz chord exercises, you’ll need to get a few chord shapes under your fingers. Each of these chords uses three notes, only the most essential notes, to make them easy to finger on the guitar. Take a few minutes to become familiar with these chords, and then move on to the next section where you’ll add rhythm and harmonic movement to these shapes. If you aren’t 100% comfortable with any of these shapes, not to worry, as you’ll be working them throughout this lesson, so you’ll become more comfortable with each shape over time. When playing the chords in this lesson, you only need to play the strings indicated in the grids. So, if a string has a dot you pluck it with your picking hand. If a string doesn’t have a dot, you don’t pluck that string. During his time with the band, he made a name for himself by using a steady four quarter-note per bar approach to jazz guitar comping. This steady rhythm gave him a strong swing feel, and a personalized approach to playing jazz standards on guitar. 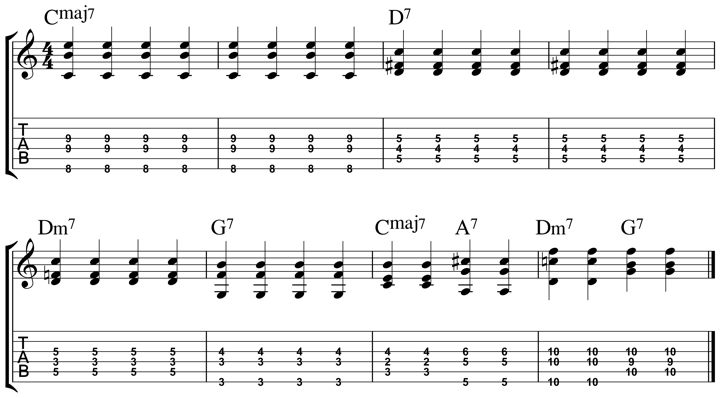 Since he began using this rhythm, it’s not only being called “Freddie Green Comping,” it’s also been used by every jazz guitarist who followed in Freddie’s footsteps. 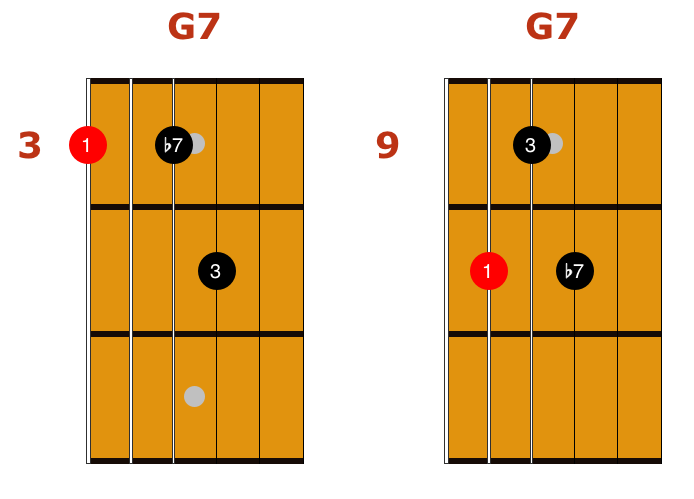 Here’s an example of this rhythm over a C7 chord to get you started. You’ll be using this rhythm for every example in the chord progressions below, so if it’s still a bit new, not to worry, you’ll have lots of practice with it in this lesson. In this first jazz chord exercise, you’ll be studying one of the most popular, if not the most popular, progression in jazz, the ii V I IV chord progression. Used in countless jazz standards, this progression is essential learning for any jazz guitarist when studying chords in the practice room. 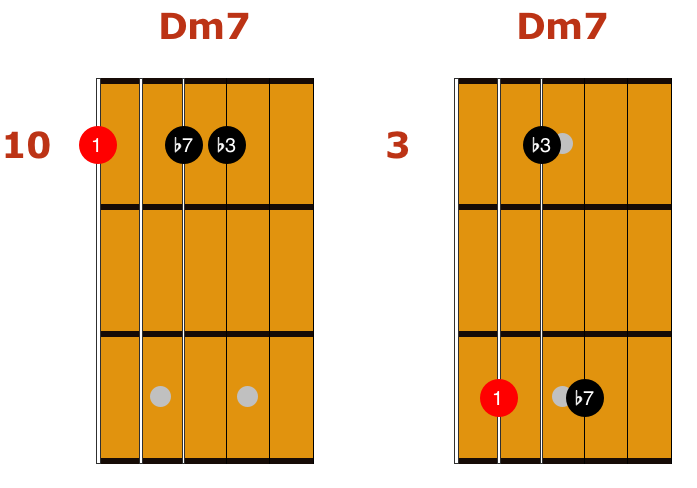 To get you started with this progression, here’s an example that begins with the iim7 chord on the 6th string and moves to each closest chord shape from there. As well, you’ll be using the easy jazz chord shapes from the previous section, and the Freddie Green rhythm you learned earlier in this lesson. In this second example, you’ll start with the iim7 chord on the 5th string and move to each closest chord from that starting point. After you can play each position on its own with confidence, you can begin moving between these positions in your studies. As well, if you feel ready, you can transpose these chords to other keys as you move them around the fretboard in your woodshedding. In this next chord progression, you’ll be learning a slight variation of the previous changes as you learn a popular jazz turnaround progression. 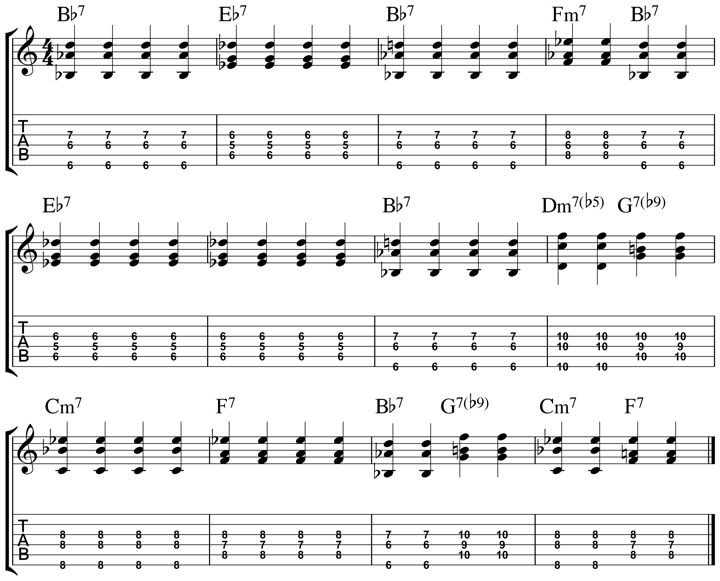 Turnarounds are used in jazz to “turnaround” the chords back to the top of a section, or the entire tune. They do this by starting on the Imaj7 chord, then moving through a series of chords until you “turnaround” to the Imaj7 again in your comping. In this case, the chords used to turn the changes back around are Imaj7, VI7b9, iim7, and V7. 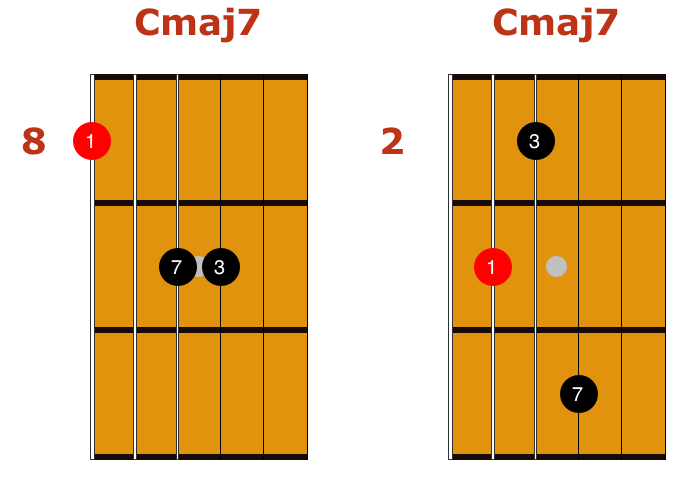 Here’s an example of these chords with the Imaj7 chord on the 6th string, and all subsequent chords moving with as little space as possible from that first chord. After you’ve learned the first example, you’ll move on to the second progression, where you’ll start with the Imaj7 on the 5th string and move to each closest chord from there. With both turnaround progressions under your fingers, you can work on mixing them together in your jazz chord practicing. As well, you can practice these chords in other keys as you work on moving them around the fretboard in your practice routine. Moving into minor key changes, you’ll know learn how to play a minor ii V I chord progression in your studies. When playing a minor ii V I, the chords are iim7b5, V7alt, and Im7. So, the roots move in the same way as a major ii V I, but the chord qualities are different in the minor key progression. Here, you’ll be learning two different ways to comp through minor ii V I chords on the guitar. The first example begins with the iim7b5 chord on the 6th string and moves to the closest V7alt and Im7 chord from that starting point. 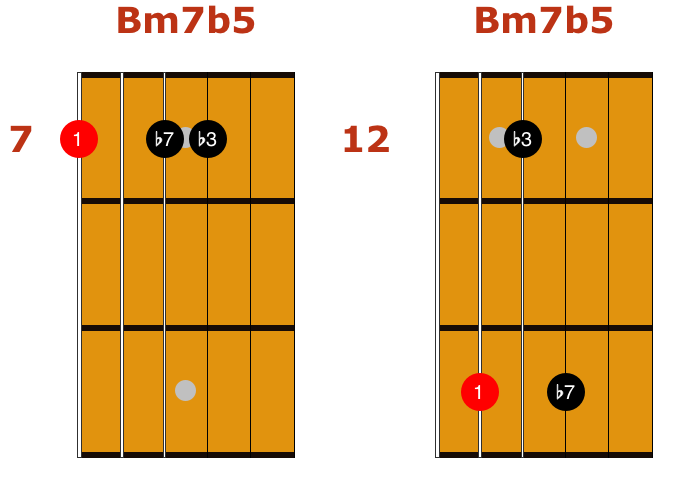 In this second example, the iim7b5 chord is played on the 5th string, moving to the closest V7alt and Im7 chords from that beginning chord change. After you can play each of these examples from memory, work on mixing them together in your studies. This’ll mean moving between the first and second position on the fretboard as you comp over minor ii V I chord changes. Lastly, if you feel ready, you can practice either or both of these examples in other keys as you take these shapes around the fretboard in the practice room. Famously recorded by Duke Ellington, this Billy Strayhorn tune is a jazz classic. Apart from being a fun tune to play, “Take the A Train” features an important jazz chord progression that you can study in the woodshed. The first eight bars of this jazz standard is built in the key of C, but also contains a II7 chord (D7 in the key below) to spice things up a bit. To help you practice this important chord progression, here’s a chord study using the easy jazz chords you learned earlier and the Freddie Green rhythm. Feel free to learn this study in four-bar chunks before piecing it all together. And, as always, use a metronome or backing track at a slow tempo when first learning this study. From there, you can speed up the tempo as you push yourself further with this progression in the woodshed. 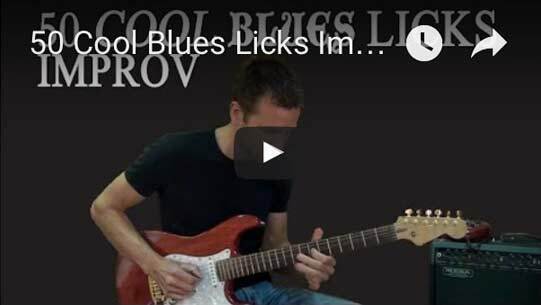 The final chord progression that you’ll practice in this lesson is the jazz blues progression. Knowing how to comp with confidence over jazz blues changes is essential for any guitarist exploring jazz in the practice room. Whether you’re doing gigs, hitting up the local jazz jam session, or just playing at home, the jazz blues form is a great way to express yourself as a jazz guitarist. Here’s an example of how to comp over a Bb jazz blues using the easy jazz chord shapes from the start of this lesson, and the Freddie Green rhythm. Go slow with this exercise, and feel free to learn it in four-bar phrases, before piecing those phrases together to form the progression as a whole. After you can play the example as written, move on to comping over a jazz blues progression but use your own chord shapes. This’ll help you increase your comping skills, and dig deeper into this important jazz chord progression at the same time. Do you have a question about these easy jazz chord exercises? Post it in the comments section below. Matt Warnock is a Canadian jazz guitarist and educator. During his career, Matt has performed and taught throughout the world. He’s also the author of 10 jazz guitar eBooks, including the free Beginner’s Guide to Jazz Guitar. Matt believes that, with the right guidance and motivation, anybody can play jazz guitar. Hi Klaus. I need some of your help trying to figure out what John Fruiscante is playing here (https://www.youtube.com/watch?v=TTiGwUSjfU4) – what mode(s)/scale is this? It sounds awesome and I thought I’d come to you for help since you are much more apt at guitar than I. Thanks in advance.